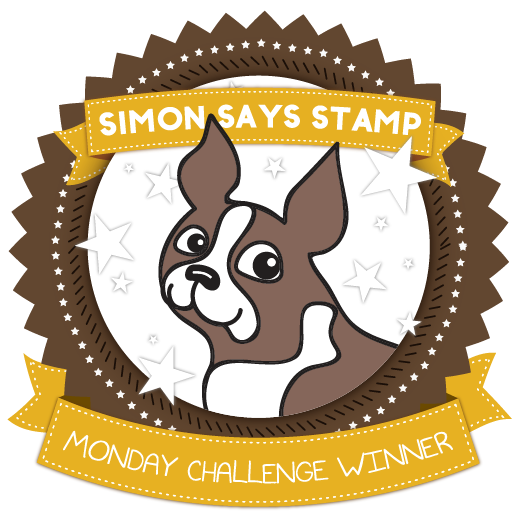 Thank you for joining us for the Farm Challenge and we hope you will all join us again this week too. 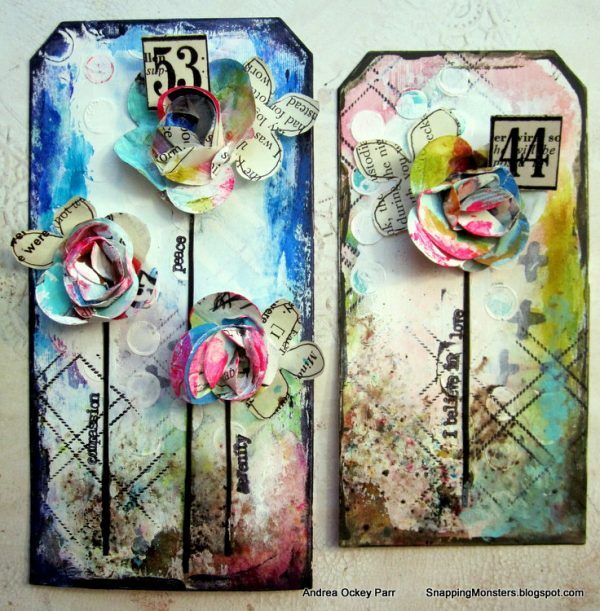 Sabrina used a Simon’s Exclusive Sketch Ranuculus Stamp Set to create her blooms and made a frame using a Tim Holtz 3D Lumber Embossing Folder. 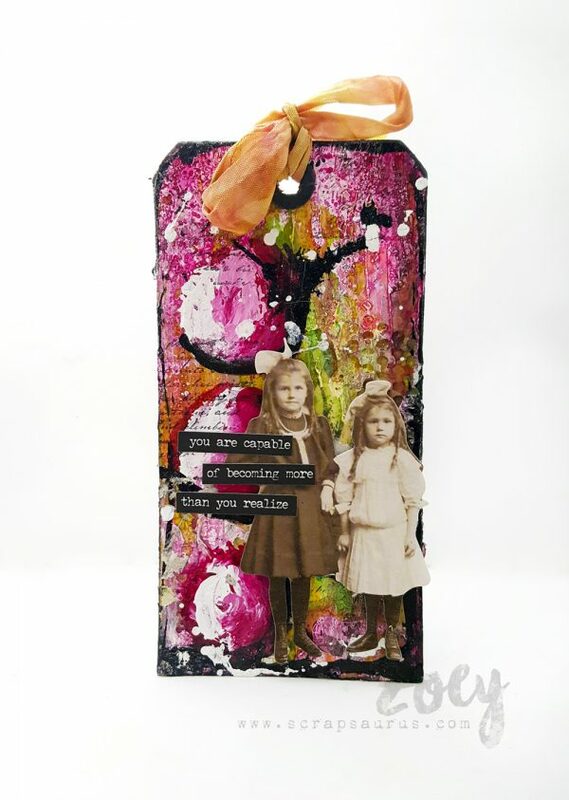 She also used a Garden Greens Thinlits Die and Paper Dolls to finish her project. 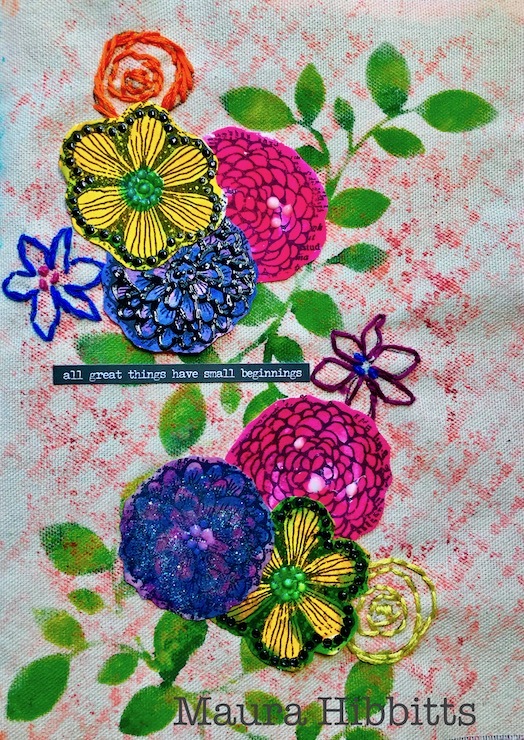 Andrea made some colorful blooms using My Favorite Things’ Rolled Rose die and Simon Says Stamp’s Hydrangea Petals die. 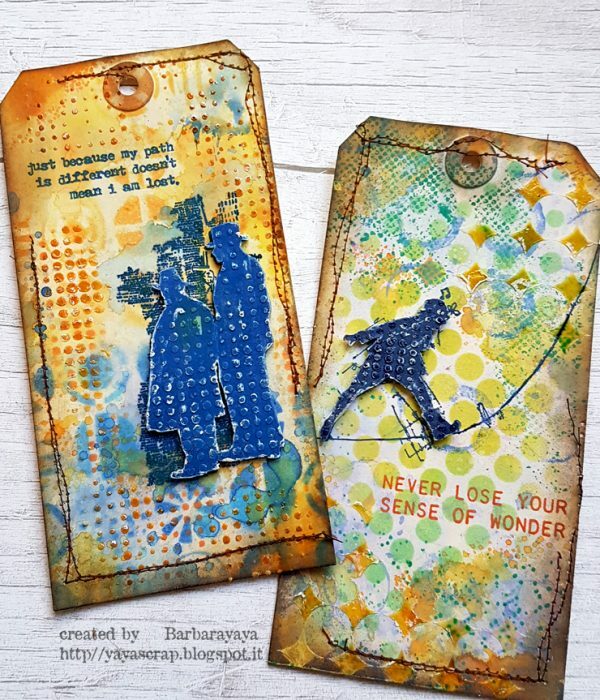 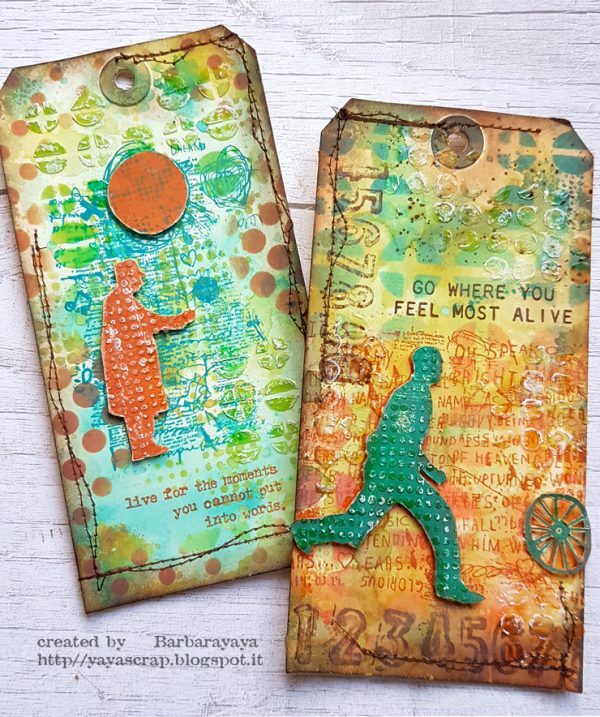 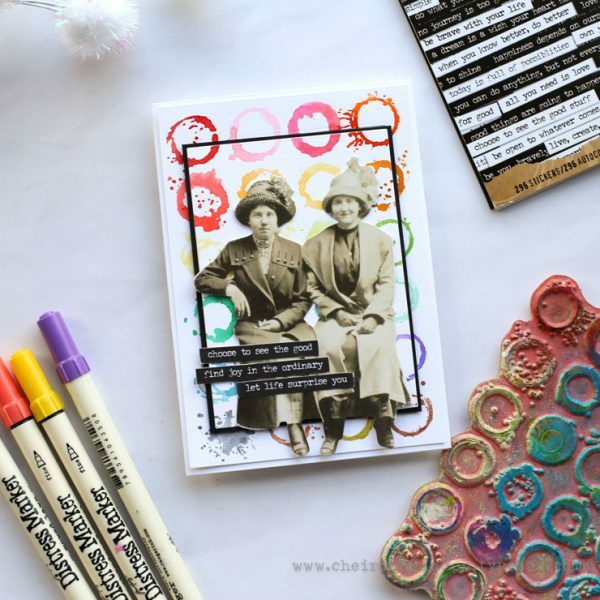 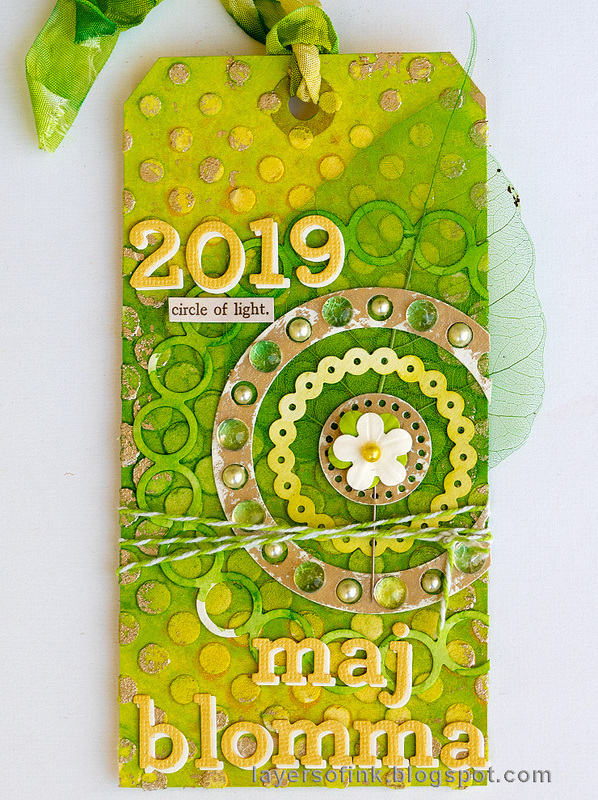 She added some stamping oomph to the background with The Stamp Market’s Criss Cross stamp. 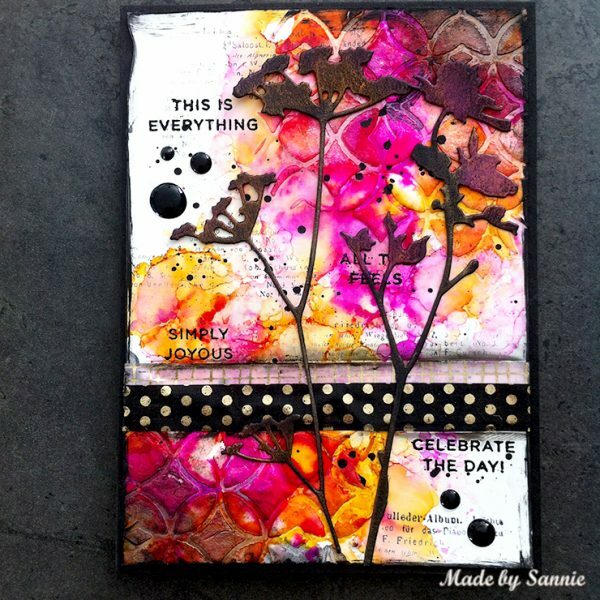 Anna-Karin made a card this week, and created dimensional inky flowers with Tim Holtz’s Funky Floral Large die set. 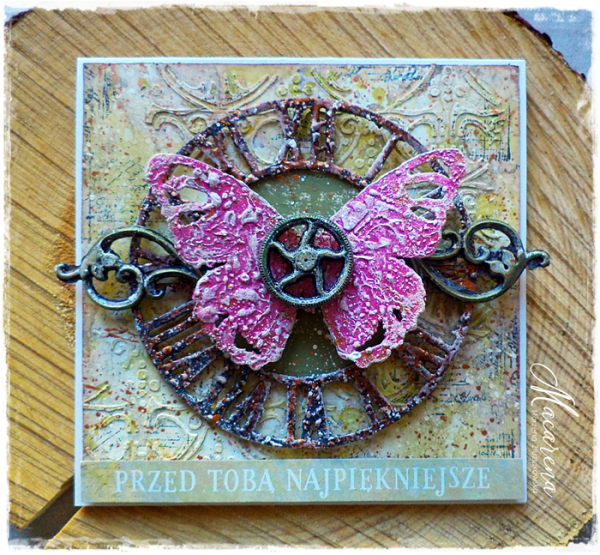 The background was stamped with Tim’s Fragments stamps and is meant to look like old wallpaper. 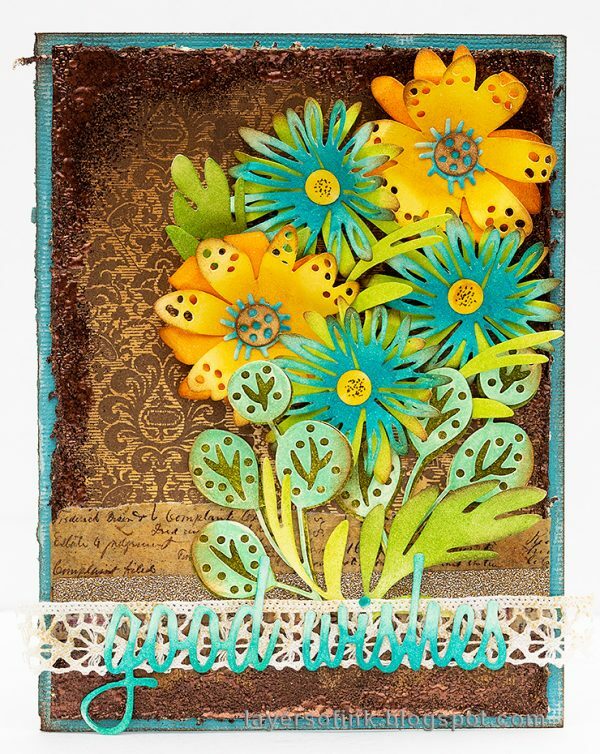 Barbara created a springy bloom of daisies using an Etcetera Small Tag and Tim Holtz Sizzix Wildflower Stems 1. 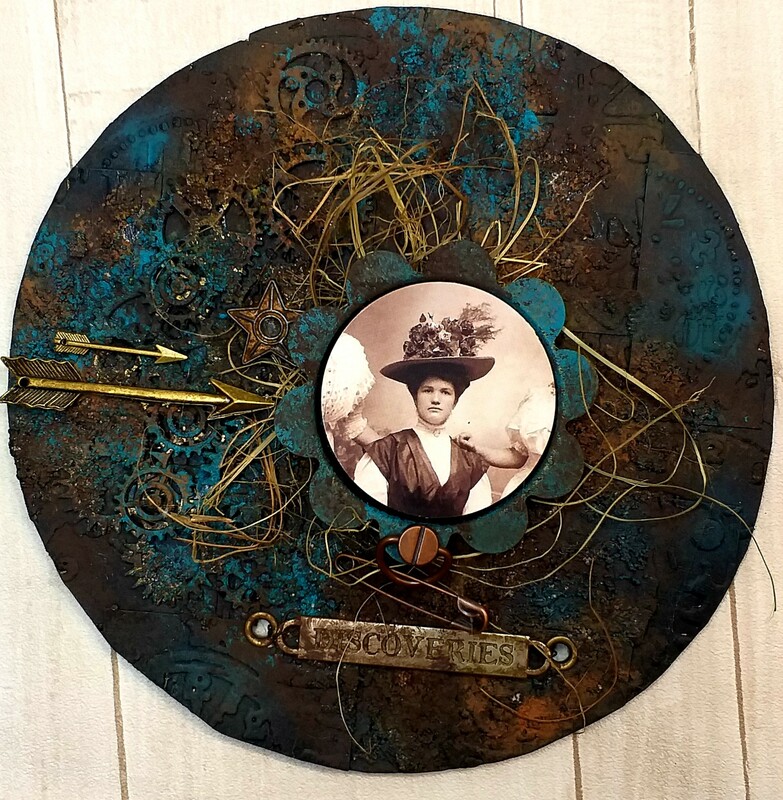 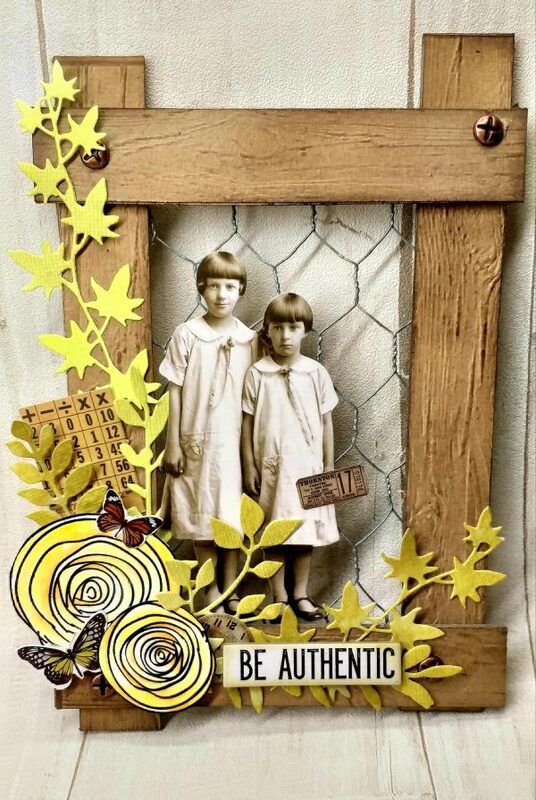 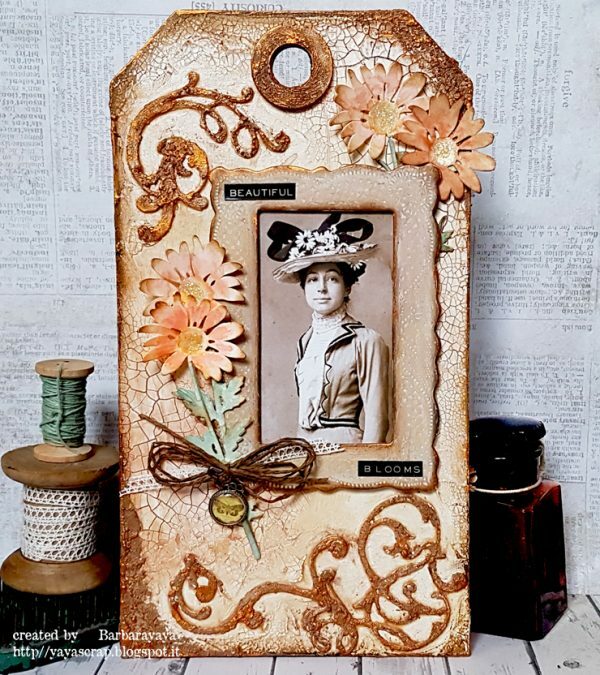 She added a vintage touch with Tim Holtz Sizzix Adorned and Idea-ology Lace Baseboard Frames. 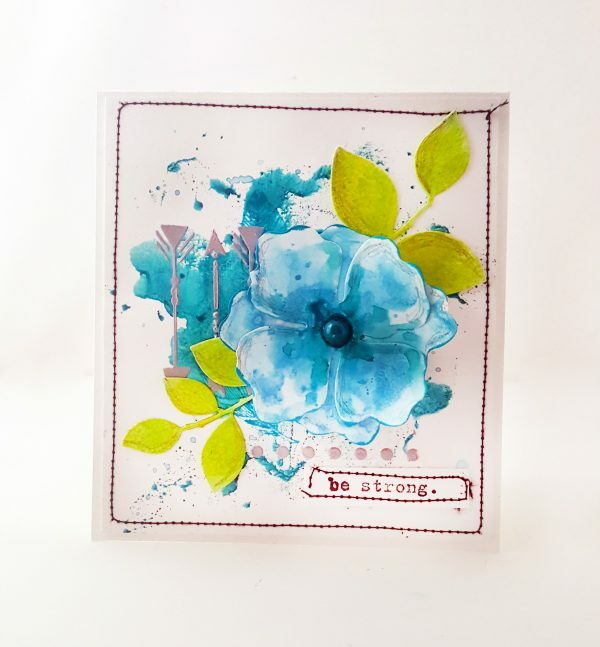 Cheiron created a watercolored floral card using the Tim Holtz Stampers Anonymous Glorious Garden set. 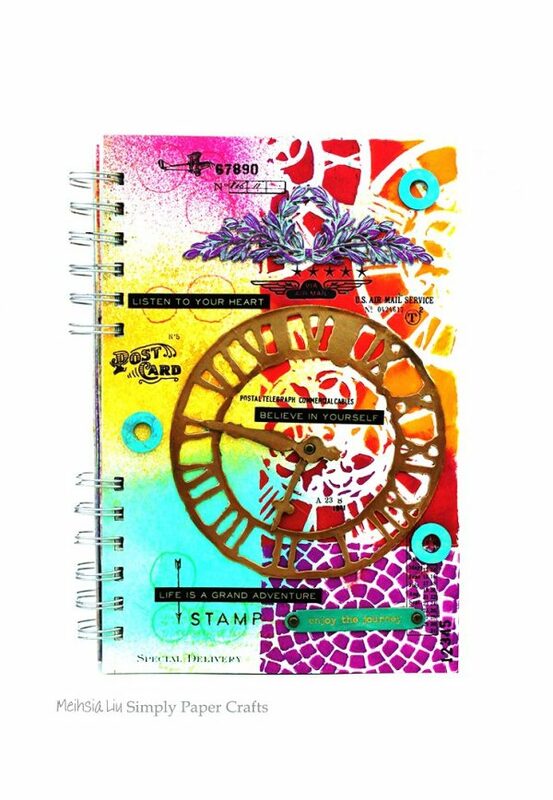 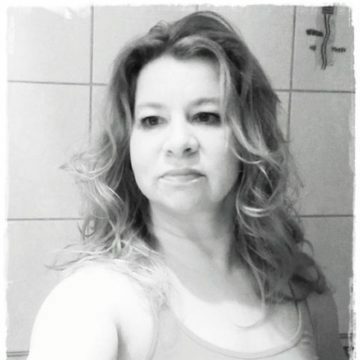 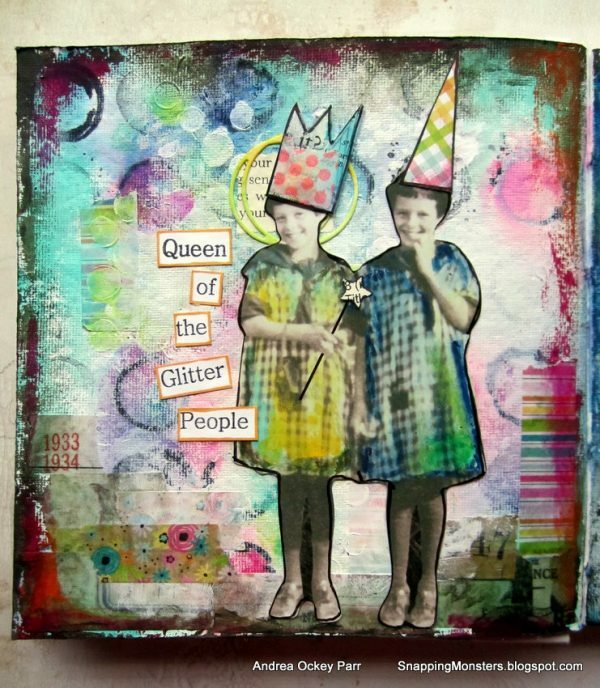 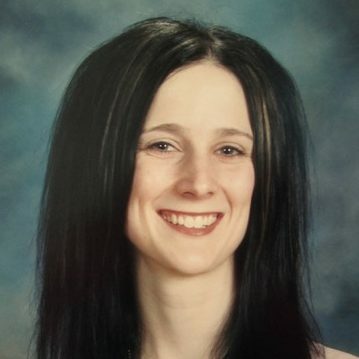 She stamped the image in Ranger Archival Jet Black Ink and colored it in with Distress Markers in vibrant colors. 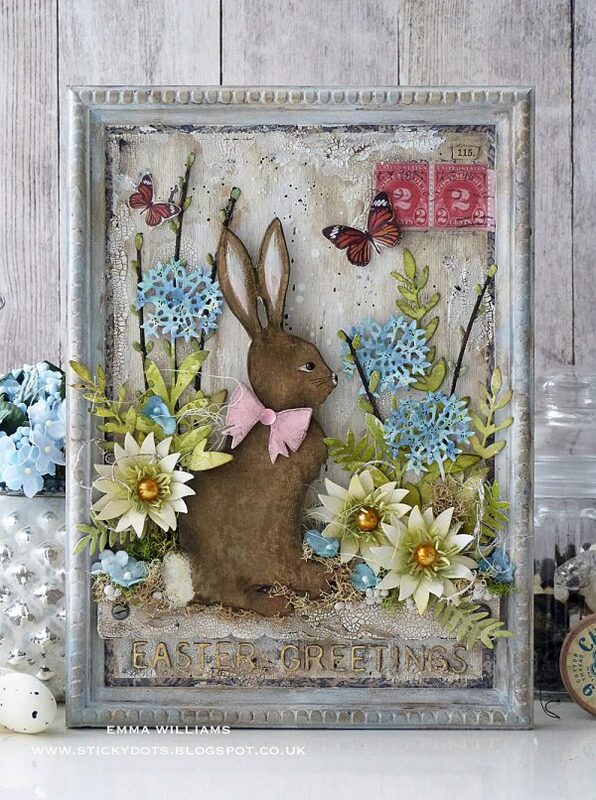 Emma was inspired by her love of Beatrix Potter and created a framed panel celebrating Easter. 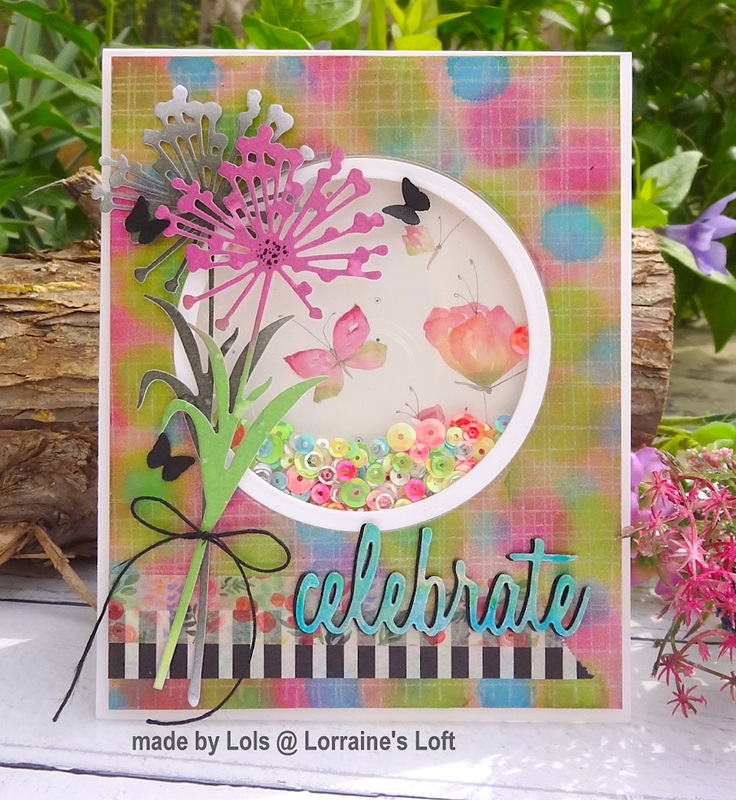 She used Tim Holtz’s Cottontail as the focal point and surrounded her with some beautiful blooms which included die cut Wildflower Stems and Funky Florals. 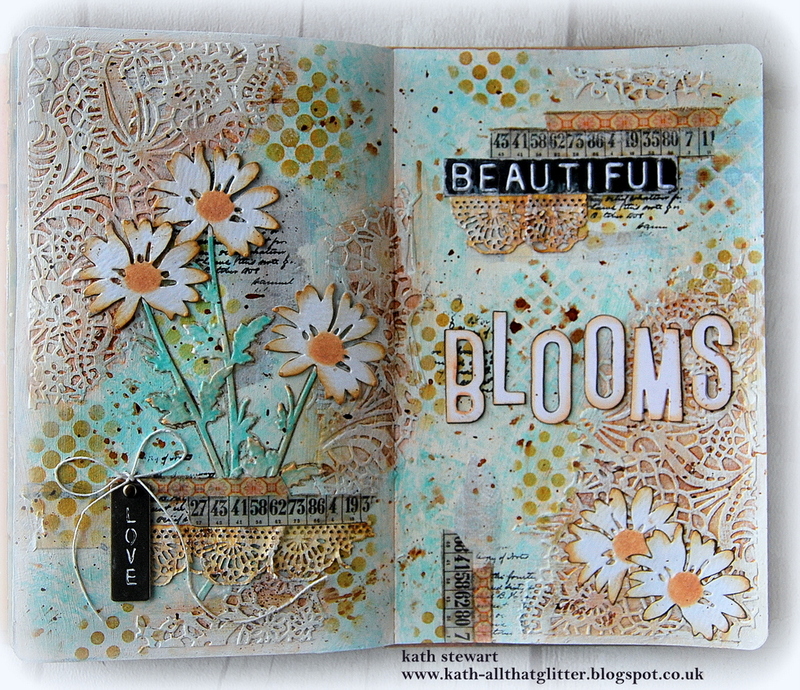 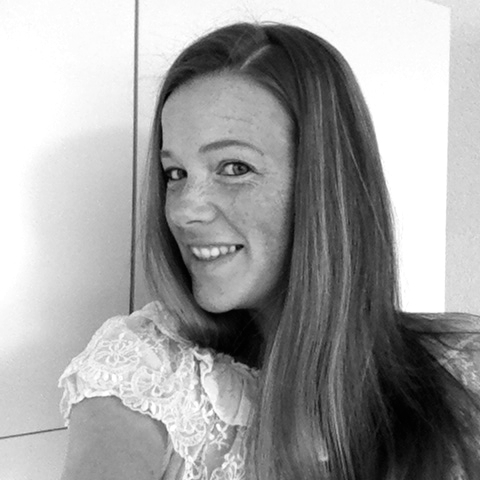 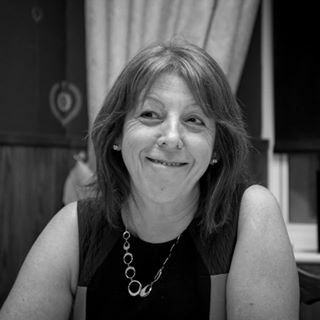 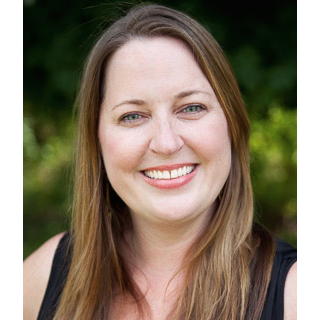 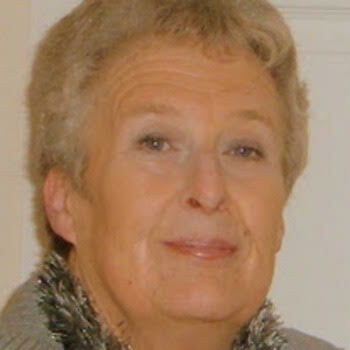 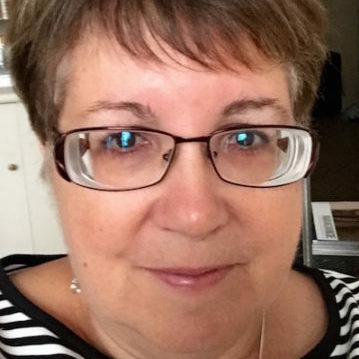 Kath created a page in her Dylusions Small Creative Journal, dedicated to the humble daisy, considered by many to be a weed but Kath thinks they are just pretty wildflowers and doesn’t mind them popping up on her lawn. 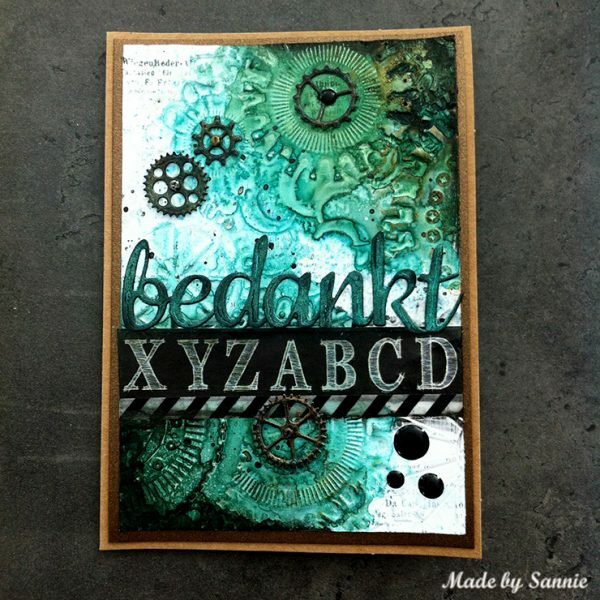 She used Tim Holtz/Sizzix Intricate Lace, Crochet, Wildflower Stems 1 and Alphanumeric Label Thinlits dies. 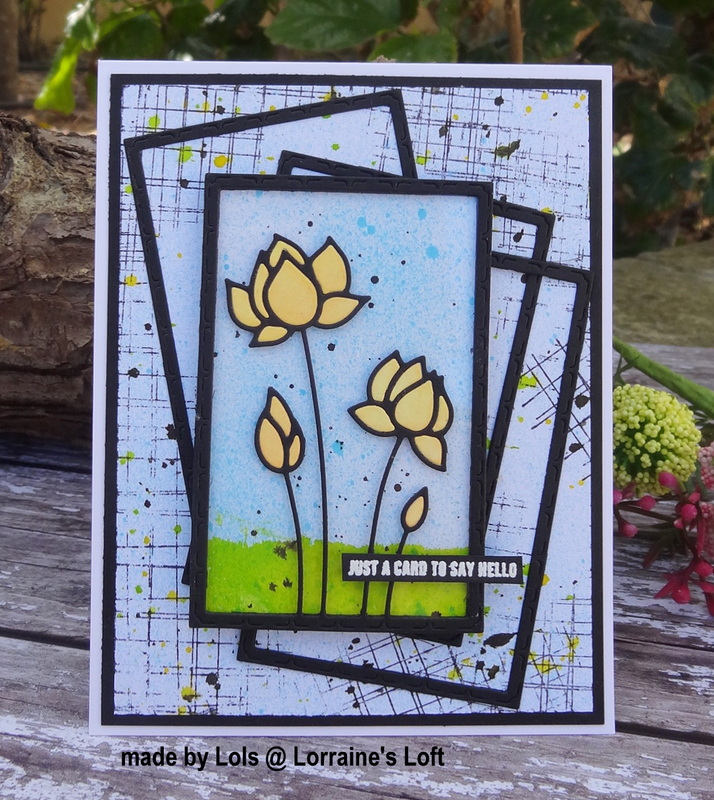 Lols made a card using a Lotus Frame Die from the latest Simon Says Stamp Blossoms and Butterflies Release. 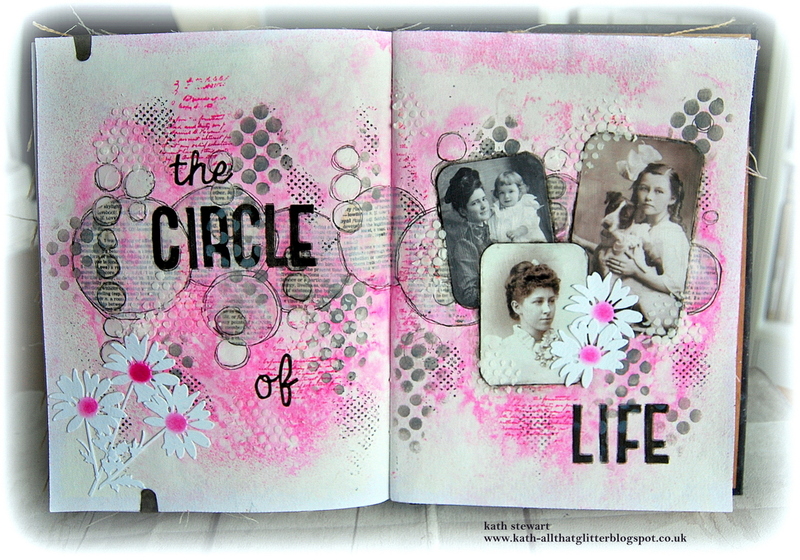 She used a new Sketchy Lines Background Stamp and a selection of ink sprays to finish. 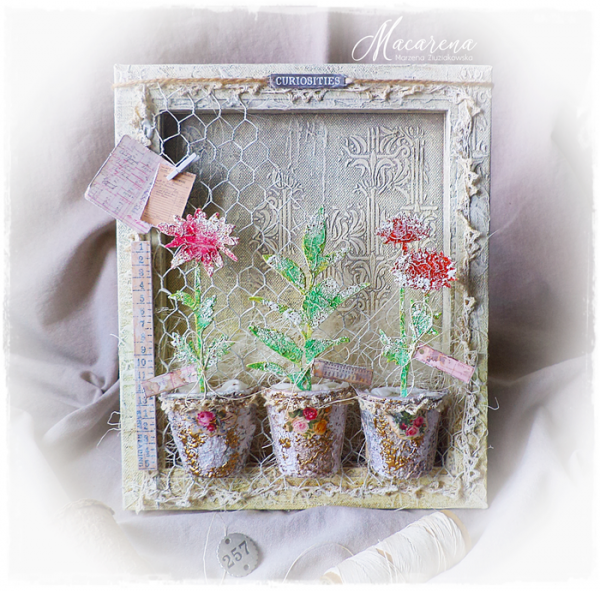 Macarena literally planted some spring flowers into a tiny pots using Tim Holtz Sizzix Large Stems Bigz L die and her lately favorite Stampendous Embossing Enamels. 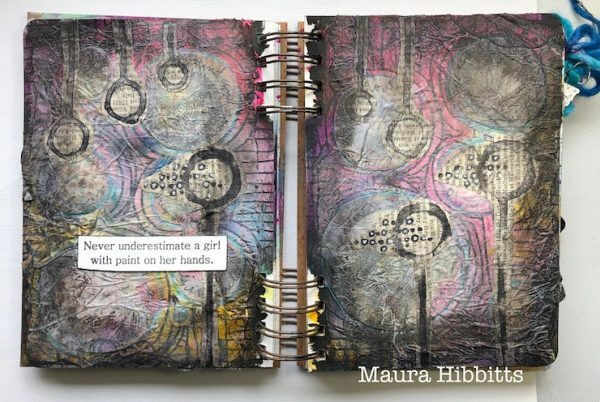 Maura is dreaming of beautiful blooms in her Dina Wakley Media Journal while she patiently waits for spring to arrive. 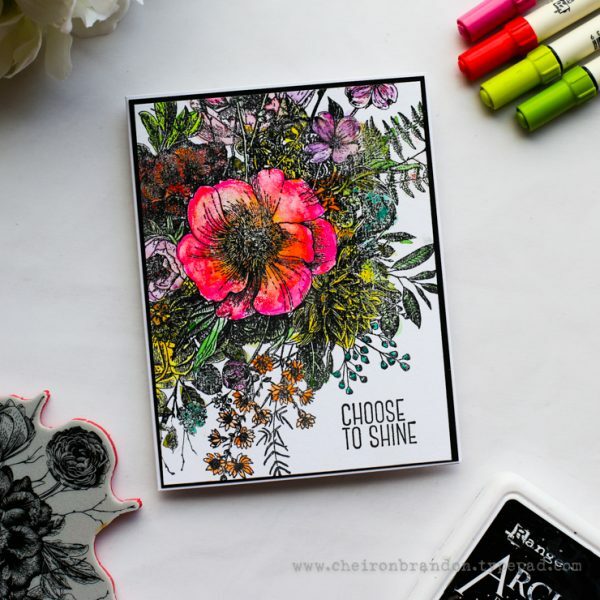 She used Carabelle Studio’s Fanciful Dahlias for the big blooms and stitched on some flowers from the Simon Says Stamp Sketched Flowers set. 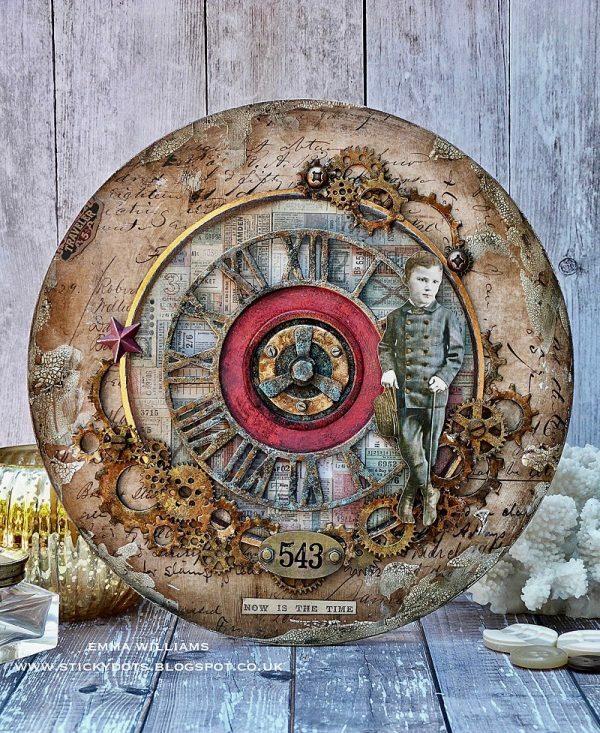 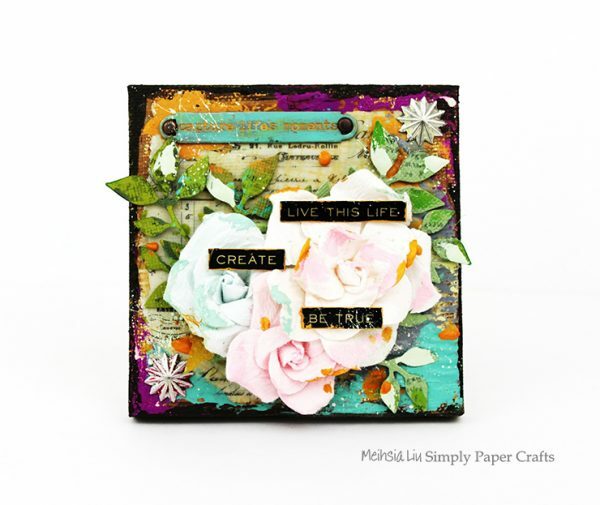 Meihsia was inspired to create a mixed media canvas using Prima Marketing Fairytales Poetic Rose Flowers and embellished with Tim Holtz Idea-ology Metal Word Band.